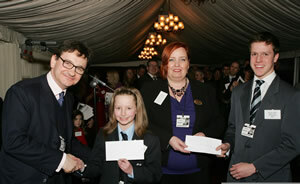 Prize giving at the House of Lords, January 2011. 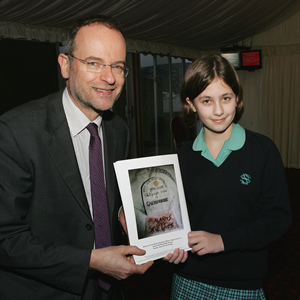 Photograph of Paul Blomfield MP and winner of the North of England, Charlotte Mason of Sheffield High School, Junior department, with her winning design. Photograph of Jonathan Kane, Director of CO-Gas Safety and Kane International, winner of the South of England, Katy Hatch, Head Teacher Mrs Olivia Paton of St Patrick's Catholic Primary school and presenting the prizes, previous winner, Wulstan Nixon.